Red and green may be traditional Christmas colors, but that doesn't mean you have to be stuck with a green dorm Christmas tree! Maybe you want tradition and then something a little different. Your dorm room is a home away from home, after all and you don't want it to look like anyone else's. For classic Christmas colors with a twist, our Red Whimsical Laser Dorm Christmas Tree is a great addition to dorm room decor. You'll will have the classic Christmas color you want but right on the branches of your dorm Christmas tree! 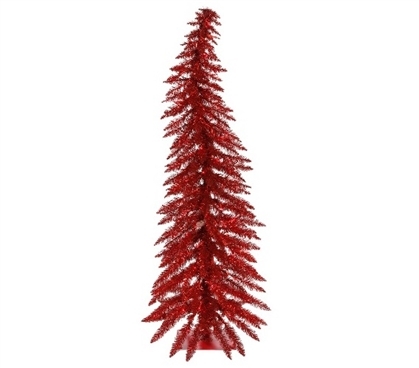 Our Red Whimsical Laser Dorm Christmas Tree has a rich red color on the branches and trunk. On the soft looking branches are red mini dorm lights for accent pieces. That means when you set up this dorm essentials item in your college dorm room, you just have to wrap some garland around the Christmas tree and place your favorite Christmas bulbs on the branches to have a complete look in your dorm room decor. With this dorm item, you don't even have to worry about moving all of your dorm furniture to have this cool dorm item displayed. Taller than it is wider, you'll be able to have your dorm room perfectly decorated for the holidays without losing a lot of space in your dorm room.